This character cutie Queensland cottage arises in the perfect location in Belgian Gardens and is ready for its new owner to move in. Nestled on a shady block in a quiet street, the home welcomes you with a spacious front entrance with oodles of charm and will appeal to home buyers at their first step into this beautiful home giving you that rustic feel throughout. Inside you will find character, style and feature doors, three spacious bedrooms; the smart, open kitchen has plenty of light and stainless steel appliances, including a dishwasher and overlooks the backyard and lower level dining. The stylish main bedroom features a free standing bathtub, walk in robe, vanity/makeup area and a separate en-suite. Make your way down to the lower level and find an open plan living and dining area with abundance amount of natural light flowing out double French styled sliding doors to the entertaining and play area where you can imagine entertaining guests, friends and families. Includes a playground, maintained gardens a large 6×9 storage shed, 2 extra carports, wooden features and extra side access and closed of area to the side for extra storage or even the dogs. 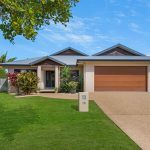 Situated in one of Townsville’s most sought after suburbs, Belgian Gardens is close to the Townsville Cbd, the Gorgeous Sunny Strand, Beach and the Cafe Strip of Gregory Street. 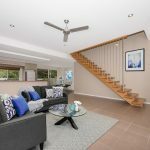 2 minutes Walking Distance to one of the city’s Best Kindergartens and Primary School’s and only a Short Stroll to Scenic Castle Hill and its many Walking Tracks. If Location is on your checklist, this property is worth a look!